I’ve begun to put blocks together from my recent winnings in the “heart in a snowball” block lotto. This was so easy to do. I did this much yesterday morning. Do you see your block? Your purple sashing really makes the snowballs look round. What a beautiful quilt in the making. . . thank you for sharing this. Ps. My block to you is going into the mail today. 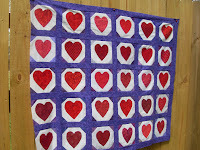 How fun to see the blocks in the first part of a quilt! It looks just great and the sashing really makes the hearts stand out. 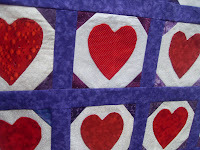 Is this lovely quilt going to be for you or for someone else? If it’s for someone else, they must be very special. Hello Gail, Thanks so much for the kind compliments. This quilt is for my daughter. Essentially, it is finished. I’d like to put put on one last purple border after some kind of pieced border. Or at least, that’s my current thought! Thanks again for YOUR, so lovely and beautifully constructed heart blocks. Thanks Sophie and I received your heart block yesterday. I’ll be adding your block to the quilt this weekend.